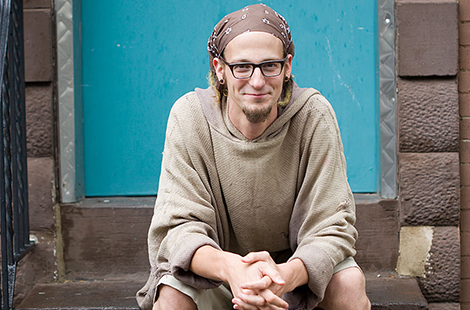 Shane Claiborne is a simple man who loves Jesus. A well-known activist, speaker and author, Claiborne will speak in chapel at Trevecca on Feb. 7 in the Boone Convocation Center on Trevecca’s campus. Born in 1975, Claiborne is originally from East Tennessee. He is a graduate of Eastern University in Philadelphia, and the author of the best-selling books The Irresistible Revolution: Living as an Ordinary Radical and Jesus for President: Politics for Ordinary Radicals (with Chris Haw). Claiborne is also the founder of The Simple Way, a community of people devoted to intentionally living out the Christian lifestyle. During a 10-week term in Calcutta, Claiborne worked alongside Mother Teresa serving the poor and vulnerable. He also spent time advocating peace and traveling among various troubled regions to offer his help and love, while living in Bagdad as part of the Iraq Peace Team. After speaking in chapel, Claiborne will also hold an open forum to discuss his latest book, Executing Grace: How the Death Penalty Killed Jesus and Why It’s Killing Us. During the forum, students will be able to ask Claiborne questions about the book. The time and location of this event has yet to be decided. Jamie Casler, director of Trevecca’s J.V. Morsch Center for Social Justice, is especially excited for Claiborne to speak on campus. Casler said Claiborne was a good fit for Trevecca because the University aims to give students a quality education while making sure students grow spiritually. According to Casler, Claiborne encourages both. Students and faculty in Trevecca’s social justice program are looking forward to hearing Shane speak next month. It will be an opportunity for social justice majors to hear from a speaker whose books have been an important part of their studies. Trevecca junior Amber Donat is thrilled Claiborne is coming to campus. For Shawna Gaines, university chaplain, giving Trevecca students a chance to hear from Claiborne was an opportunity she couldn’t pass up. Casler hopes that when students leave the chapel service next week they feel encouraged and inspired.